It's almost like viewing the Earth from space. Controlled by a precise gear-and-motor system, illuminated by an LED lamp, this fascinating globe rotates on its axis in real time, angled according to the actual date. See which parts of the planet are in day and night, and where the sun is rising and setting; watch the northern and southern hemispheres go through seasonal change. A ring in the middle shows the current time anywhere in the world, and a dial at the bottom displays the date and season. Observe the complex motions our planet undergoes as it moves through space, circling the sun. 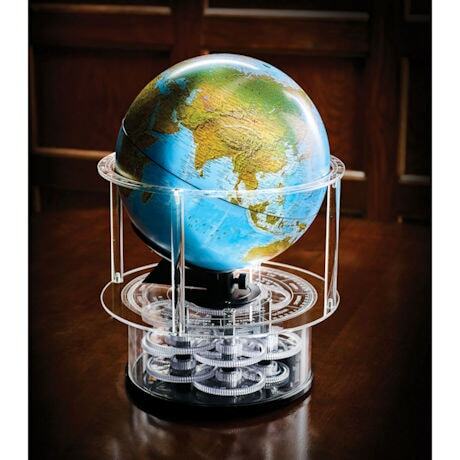 18" high; globe is 11" diameter. Plastic and metal. Assembly and set-up required. Comes with AC adapter and complete instructions. Ages 10 and up.